To which I would say: Exactly. According to Wesley Emblidge’s recent review of the film on The Tam News website, the latest adaptation of Gatsby was a “showy, overblown mess of a film” in which “the characters… never feel like real peole, just manufactured creations, even somewhat cartoonish characters.” Setting aside the fact that all fictional characters are “manufactured creations,” (and that all “creations” are “manufactured”) I would like to politely suggest that Emblidge is missing the point. Jay Gatsby himself was a “showy, overblown mess” of a man as he threw extravagant parties in an effort to catch the attention of Daisy Buchanan. He was a “cartoonish caricature” of his own creation, figuratively running up an endless Stairmaster in his endless efforts to be accepted by the American elite and win Daisy’s love. These ideas are some of what “make the book interesting in the first place,” as Emblidge puts it. He claims they were absent, but I disagree; the fact that they came through in the film shows how effectively Luhrmann actually presented the characters’ true essences. Another criticism that is widely held seems to be that Gatsby was too outlandish in its visuals: the film was, apparently, over-the-top, computer-generated, and extravagant to a fault, especially when it came to the party scenes. But I wonder – would such critics have been happy to see a series of low-key Gatsby parties, accompanied by some relaxed background jazz music? This is a movie; a piece of art. The responsibility of a storyteller in this case is not to present real life as realistically as possible; it is to present a story in an enjoyable way that offers a different perspective on the ideas portrayed in the film. Personally, I thought the party scenes in Gatsby were fittingly elaborate. They showed just how childlike Gatsby was in his desperation and search for recognition – in presenting this outrageous excess, the film proved that these parties were just another pile of shirts to throw at Daisy to impress her. 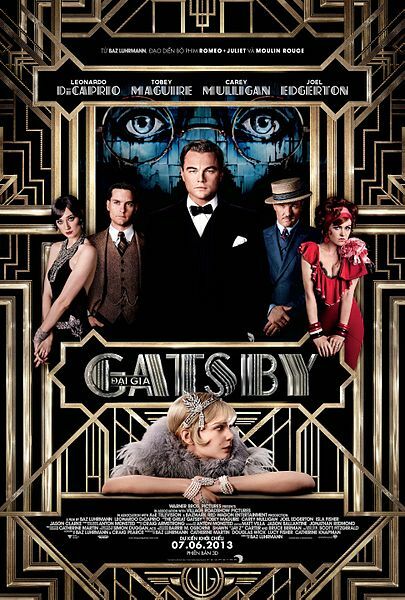 The flashy effects used in Gatsby, in addition to its carefully selected modern-day soundtrack, only serve to draw a connection between the materialistic world of the 1920s and the one we live in today. Maybe Gatsby ended up being a story within a story. Its relative critical failure only proves one of Fitzgerald’s core messages: Money can’t buy you – or a movie – love in America, no matter how smart or beautiful that movie is.